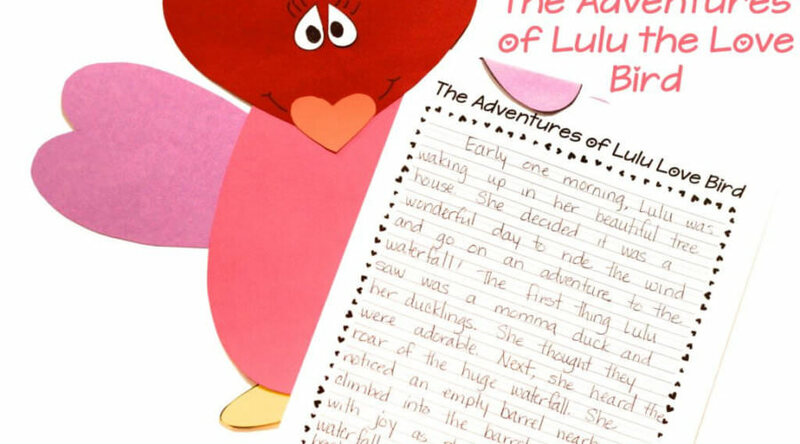 Valentines Day cuteness and creativity in the form of Lulu the Love Bird narrative writing is joining the presidential and patriotic fun this month. This little holiday just can’t be ignored when littles are involved. In celebration of Valentines Day, we will have a quick and easy ice cream sundae party and pass out our Valentines on the 14th. But in the days prior to that, we will be immersed in a fun creative writing lesson. One of my favorite teaching passions is teaching writing. I love helping other teachers teach writing, too. It wasn’t always that way. I used to get very stressed about my daily writing block. Now the success of the kiddos spurs on my love for that writing block each day! During February we’ll be doing a lot of expository writing, but the stories that the kiddos come up with for The Adventures of Lulu Love Bird are some of my favorites. I’ve written out my lessons so that other teachers can enjoy the same creative outpouring in their classrooms. As I’ve said before, I’m not a fan of the traditional “writer’s workshop”. The process can be painstakingly slow. In my experience, too many kiddos get frustrated. All of my paragraph writing lessons center around writing with a plan. The visual aspect of the narrative writing plans I use helps encourage student engagement and “buy-in”. They immediately take ownership of the story they have “drawn out” and can’t wait to explain it further. This is the narrative paragraph writing plan that I have found to be most effective in ensuring engagement of all students. It is super exciting seeing their stories develop. It’s even more thrilling watching their giddy happiness has they share what they’ve created. Although the lesson is clear in focus, the direction of their stories are completely up to them, so Lulu’s Adventures vary a whole lot with each kiddo. After nearly all of our week-long writing projects, we end with a craft. It is the culminating activity that they look forward to. It is also the “adorableness” that holds their written creations. This craft is so fun! Lulu is created entirely of hearts. The Adventures of Lulu Love Bird includes the blackline masters for the entire project in easy to copy pages. The kids LOVE it and it is so dang cute up on the bulletin board! You can grab The Adventures of Lulu Love Bird in my store.